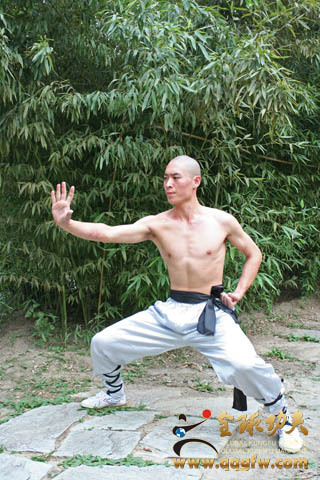 Full-stage Skill of Si Duan Gong, is one basic exercise of Shaolin 72 Skills. 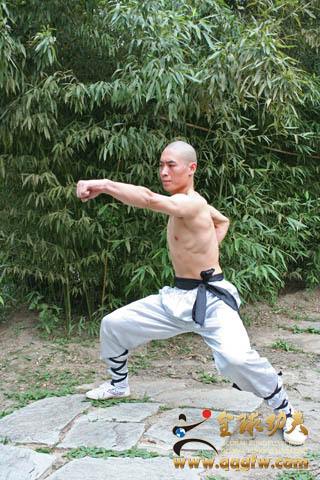 It is a bit like Yue Wumu’s Ba Duan Jin, and takes horse stance and spring legs as the basis. 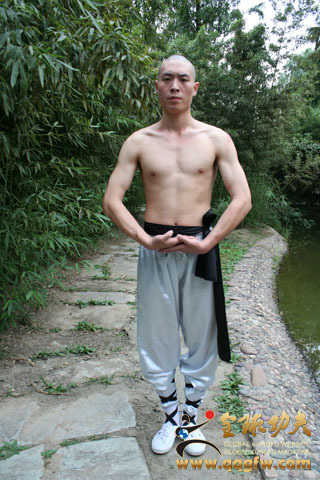 Stand up straight, raise chest; eyes looking at front, hands crossing, arms and legs straight, knees closing. Stretch out arms sideways, palms circle over head, then palms hold upward as if carrying a heavy objection of thousands of weight. Hands lift up as high as possible, eyes looking front, exerting force from neck. Then top body stretches forward, bend down until palms cover ground, the lower the better. While the legs should keep straight all the time. Stand up straight, turn your head slowly rightward, try to looking back and the left heel. 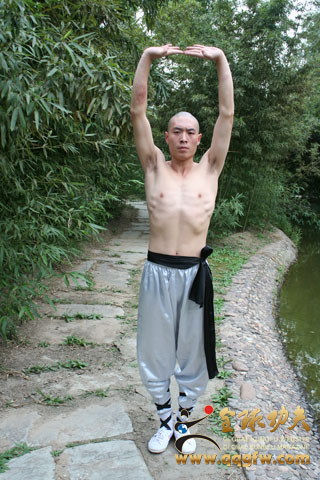 At the same time, erect the chest with body steady, shoulder in balance, then turn head back to the former position. Then turn head to left, eyes trying to look at right heel; then turn back to the former position. Repeat it. 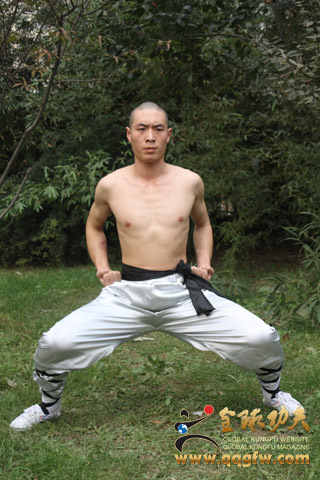 Stand in horse stance, erect your chest, body straight without leaning forward. 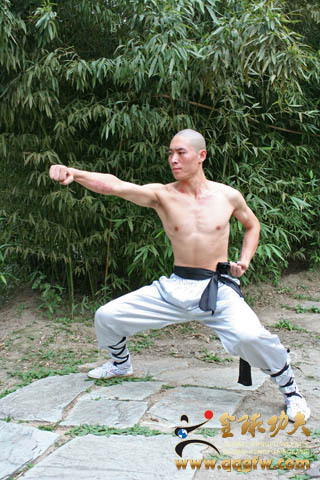 Clench fists tightly on sides of waist, palms upward, and eyes looking at front, left leg going down and stretching out like covering the ground. Left hand show hook to left, right hand push to right, body turning to right, right leg bending forward, eyes looking at right palm like pushing windows to watch moods. 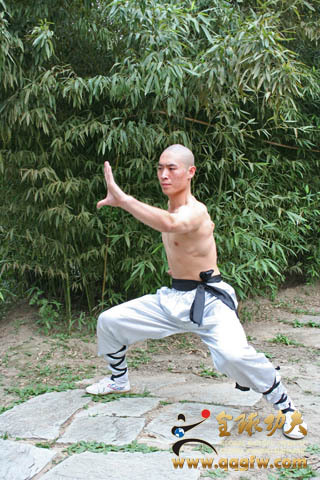 Then right leg bends down to ground and then stretches out straight, right hand show hook to right, left hand push to left, body turn to left, eyes looking at left palm, left leg stamp forward, then return to attention stance. Separate two feet to left and right into horse stance, clenching fists closely on sides of waist; right hand pushes out forcefully. Hold fists at the height of shoulders with palms downward; open right fist into palm and use five fingers to capture; then draw it back into fist, and hold it on waist. Left hand attacking forward with palm downward; right fist attacks forward, left fist captures backward. Then change palms into fist and draw back on waist. Repeat it until you are tired. Return into attention stance. 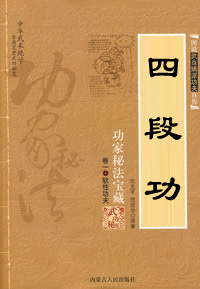 Though Four-stage Skill (si duan jin) is a little mini, the quietness and pureness of mind is necessary, and the breath also needs attention. When go down, you should take a deep breath; while when aspirate, it should be smooth and easy. Every movement should be taken slowly and forcefully gradually.